We've combined the charm of a traditional farmhouse with a very up-to-date plan, including a convenient first floor master suite with whirlpool tub and shower. At the heart of this home is an open kitchen, breakfast area, and large great room with access to the covered back porch and ample deck with seating and spa location. The kitchen features an island counter with separate wet bar for easy entertaining. 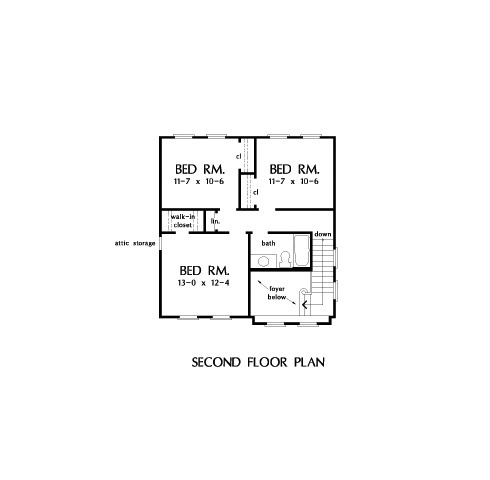 Upstairs, three bedrooms share a full bath to create the perfect family home. 1st Floor: 1410 Sq. 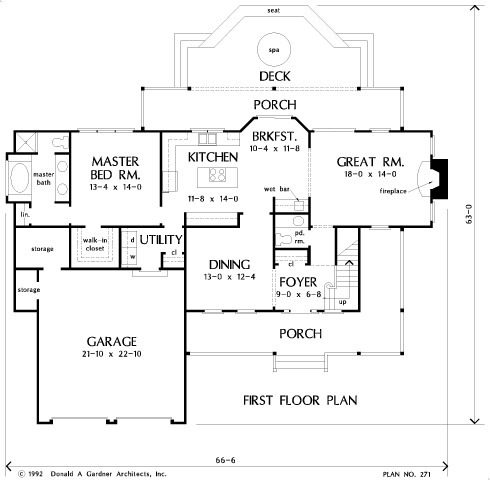 Ft.
House Dimensions: 66' 6" x 50' 8"
Great Room: 18' 0" x 14' 0"
Foyer (Vaulted): 9' 0" x 6' 8" x 17' 0"
Dining Room : 13' 0" x 12' 4" x 8' 0"
Great Room : 18' 0" x 14' 0" x 8' 0"
Kitchen : 11' 8" x 14' 0" x 8' 0"
Breakfast Room : 10' 4" x 11' 8" x 8' 0"
Utility Room : 9' 6" x 6' 0" x 8' 0"
Garage : 21' 10" x 22' 10" x 0' 0"
Master Bedroom : 13' 4" x 14' 0" x 8' 0"
Bedroom #2 : 11' 7" x 10' 6" x 8' 0"
Bedroom #3 : 11' 7" x 10' 6" x 8' 0"
Porch - Front : 32' 8" x 6' 6" x 0' 0"
Porch - Rear : 39' 6" x 6' 6" x 0' 0"
Deck / Patio : 36' 0" x 12' 4" x 0' 0"
Storage (Other) : 3' 2" x 6' 0" x 0' 0"